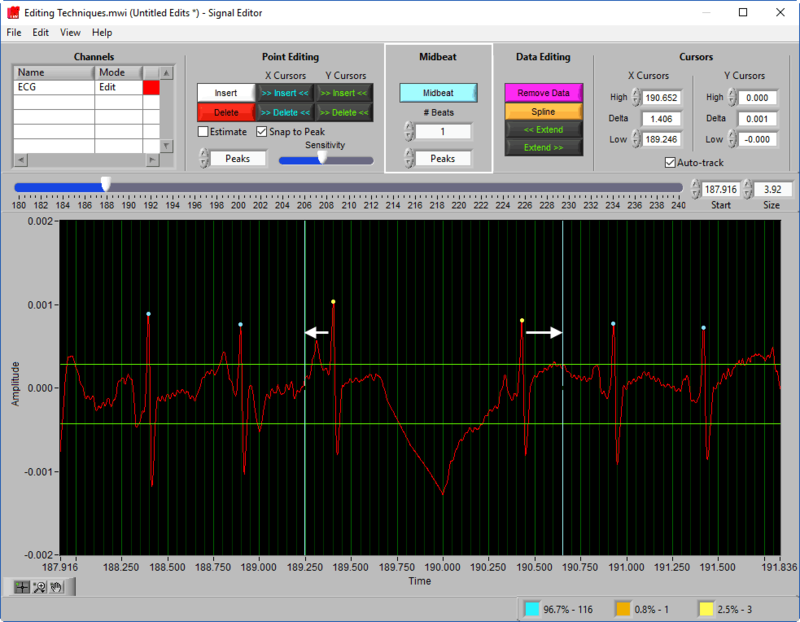 The Midbeat function in the ECG editor allows you to insert a new R peak marker between two pre-existing R peaks. This is useful for when it is difficult or impossible to see a missing R peak in the data, but the existing R peaks are being flagged as artifact due to an elongated inter-beat interval (IBI). It is also extremely useful when dealing with cardiac conditions and/or arrhythmia in HRV analysis. MidBeat AutoPeak should be used when there is a visible peak between the two pre-existing R peaks, but it simply has not been marked. It is also useful when there are multiple peaks between the two existing R peaks, but you are having trouble deciding which one to mark. First, ensure that the Midbeat AutoPeak switch at the top of the screen is set to “ON”. Next, using the mouse, grab and drag each of the blue vertical X cursors so that they lie outside of the pre-existing R peaks between which you want to place a new R peak. 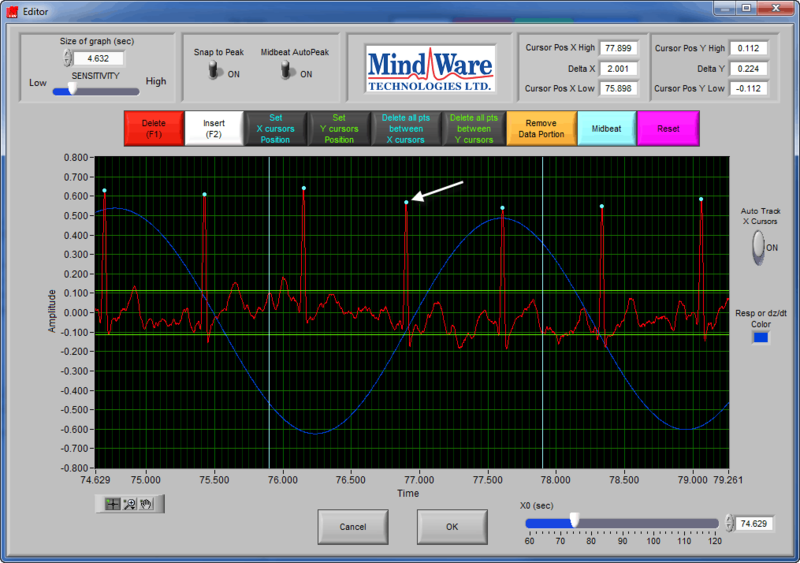 Next, press the blue Midbeat button to insert a new R peak on the most likely peak in the specified time widow. Confirm that the placement is satisfactory and, if so, proceed with cleaning the rest of the signal. If there is no clear peak which could conceivably be the missing R peak, whether due to extreme signal noise or lack of signal, the next step is to insert an Absolute Midbeat. As mentioned previously, the Absolute Midbeat is also an important tool when dealing with arrhythmia, but this is outside of the scope of this article. By setting the Midbeat AutoPeak switch to “OFF”, the midbeat function will instead place an R peak marker at the mathematical center between the two pre-existing R peaks. In the same way as above, drag the blue vertical X cursors to either side of the two known R peaks and press the blue Midbeat button. Here we can see a peak is placed not on the signal, but at the exact midpoint, and the timing has been restored. Note: This technique is only useful when analyzing ECG data for Heart Rate Variability, not Impedance Cardiography. HRV analysis requires that a contiguous R peak timing series be maintained in order to calculate accurate statistics. The Absolute Midbeat preserves the continuity while minimizing the statistical impact. In Impedance Cardiography, using this technique would inject bad data into the Ensemble Average and is therefore generally not recommended. Check out this blog post for more on the topic. If there is no clear peak which could conceivably be the missing R peak, whether due to extreme signal noise or lack of signal, the next step is to insert a Midbeat. As mentioned previously, Midbeat is also an important tool when dealing with arrhythmia, but this is outside of the scope of this article. For more information, see this blog post. First, move the two blue vertical X cursors so that they are outside of the two known good R peaks. At this point, the Midbeat button in the toolbar will become enabled. Pressing the Midbeat button will insert a new R peak at the exact midpoint between the two existing R peaks. The peak has been marked blue, meaning proper timing has been restored. Notice the orange cross around the new peak – this indicates that it is an estimated location. Refer to this blog post for guidelines on how many of these types of points are acceptable in a given segment. You can use the Point Distribution indicator in the editor to keep track of these edits. In the event that multiple beats are missing, the editor will automatically detect how many beats should exist based on the existing beat-to-beat timing present in the segment. Note: This technique is only useful when analyzing ECG data for Heart Rate Variability, not Impedance Cardiography. HRV analysis requires that a contiguous R peak timing series be maintained in order to calculate accurate statistics. Inserting midbeats preserves the continuity while minimizing the statistical impact. In Impedance Cardiography, using this technique would inject bad data into the Ensemble Average and is therefore generally not recommended. Check out this blog post for more on the topic.